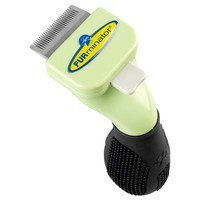 FURminator Long Haired Dog deShedding Grooming Tool is a highly advanced tool that has been tailored especially for the grooming needs of dogs with hair longer than 2 inches. Taking away the hassle of grooming your dog, this revolutionary product optimises grooming efficiency. The exceptional quality stainless steel blade has been finely engineered so that as you groom, the blade reaches deep beneath your dog's long topcoat to gently remove all the loose undercoat hair. For even more practicality, the quick and easy FURejector button removes loose hair from the tool, making the tidying up process completely hassle free. Reducing shedding by up to 90%, the FURminator Long Haired Dog deShedding Grooming Tool is the number one choice for professional groomers and veterinarians internationally.